The DHWG is a unique way to make domestic hot water using a high efficiency boiler as the heat source. Provides virtually instant domestic hot water from Slant/Fin Lynx and CHS and similar high efficiency boilers with priority control capabilities. 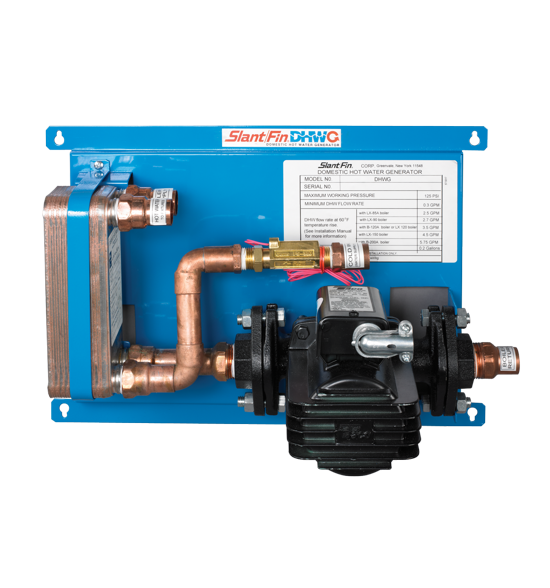 Incorporating a brazed plate stainless steel heat exchanger, boiler water flows between half the plates transferring heat to domestic water on the other side of the plates. The hot water [production is limited primarily by the boilers BTUH output. This remarkable unit transfers heat to the domestic hot water with nearly 100 percent efficiency. As soon as there is minimal flow of domestic hot water, the flow switch activates both the boiler and the circulator and within seconds hot water is available for domestic purposes. It requires no maintenance or cleaning and will last for years and years. A circulator pump and flow switch are included. The pump is sized to overcome the friction losses of the boiler and the heat exchanger and therefore provides enough boiler water flow to transfer the maximum amount of heat energy from the boiler to the domestic hot water.